I've loved Aveeno products for a long time, and always go back to them for reliable body and face lotions at the drugstore. I featured their classic Positively Radiant Daily Moisturizer here in my "Daily Moisturizers for Every Skin Type", and a great, affordable mineral sunscreen from them here. 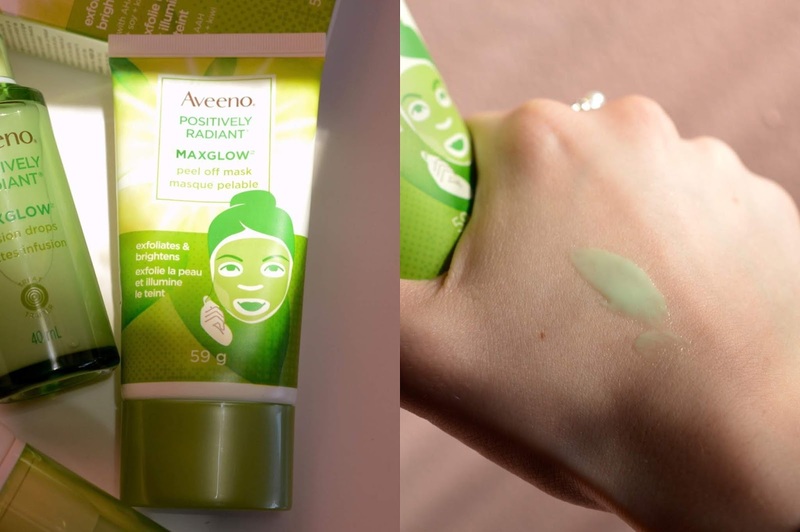 I recently received an awesome selection of their new MAXGLOW collection from ChickAdvisor to review, and have been enjoying each of the new and innovative formulas that can be used on all skin types. 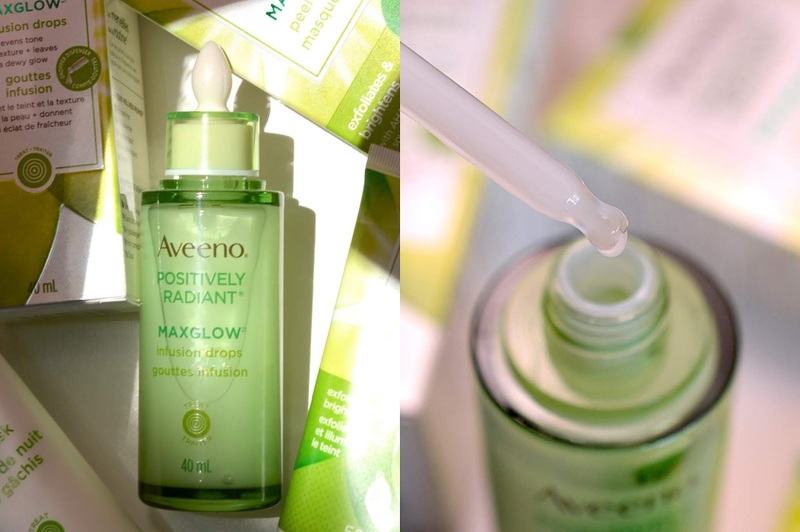 AVEENO® POSITIVELY RADIANT® MAXGLOW™ INFUSION DROPS - Info! This hydrating serum aims to deliver a "lit-from-within" glow, designed to enhance your natural radiance. Crafted with a blend of moisture-rich soy and kiwi complex, you'll see an improvement in skin tone, texture and radiance with regular use. Either apply a few drops to your skin before moisturizer, or mix with your favourite moisturizer - morning and night. I've also seen people mixing this with foundation to create an even, glowy layer of coverage with less caking. I really like the faint fragrance, cute dropper, and high-end feel of this product. It reminds me of Estée Lauder Advanced Night Repair serum with its gelly texture and plumping effect. If you want the experience of an expensive serum at a more affordable price-point, definitely look to this little bottle of glow - it's super multi-purpose! AVEENO® POSITIVELY RADIANT® MAXGLOW™ PEEL OFF MASK - Info! Infused with alpha hydroxy acids, soy and kiwi complex, this peel off mask gently exfoliates dull, tired skin to reveal smoother, more even skin tone and texture. Just apply the mask to your face, let dry, and gently peel off in one piece—no rinsing required. I think these peel-off masks are a fun skincare product that help with flaky skin. I definitely don't find it to be gentle in the slightest - the tugging and pulling is very intense on my sensitive skin! That being said, it isn't irritating, per se, and it does serve its purpose. Just make sure to avoid the brows and hairline, and you'll be good. 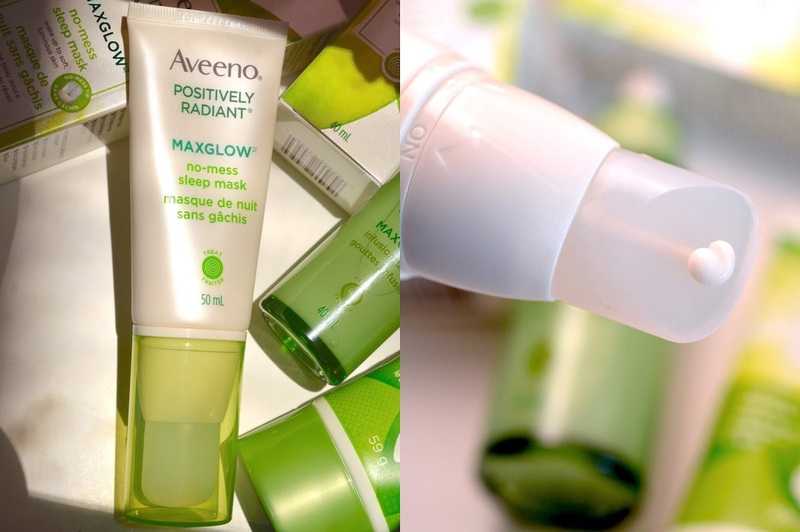 AVEENO® POSITIVELY RADIANT® MAXGLOW™ NO-MESS SLEEP MASK - Info! Wake up to softer, more radiant skin. This nighttime face mask actively works while you sleep and replenishes dry, damaged and uneven skin. Infused with soy and kiwi complex, the sleep mask glides on with a mess-free applicator and hydrates your skin overnight. Yaaay for sleep masks! This reminds me a lot of my *beloved* Avène Soothing Moisture Mask, or a better version of the LANEIGE Sleeping Mask. It has a nice, thick texture that sits well on the skin, sinking in to calm and plump your complexion. I have combination skin, and find that this mask is very gentle and does not clog pores. A really nice option at the drugstore for when you want to wash-and-go, since I usually forego my toner, serum and moisturizer when I use a sleeping mask. Because, lazy. I also love the lockable rubber spatula applicator concept, the packaging on this product is truly fabulous. That being said, I think this packaging would be better if the spatula rubber was more flexible - it is hard to smooth the mask around my nose.. and I always need to go in to massage the product thinly so that I can sleep with it on. I think the packaging would be better on the peel-off mask! Have you tried the super-hyped Aveeno Maxglow line? Let me know what you think!